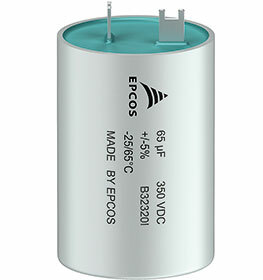 For the DC link of inverters, TDK has introduced an EPCOS film capacitor with dimensions of just 40 x 58 mm (d x l) with a rated voltage of 350 V d.c. and a capacitance of 65 μF. This means that the capacitor, which has the order number B32320I2656J011, has a very high capacitance density of 0,9 F/cm³ and offers up to 50% more capacitance per volume than comparable capacitors. The space it requires on the PCB is correspondingly small. Other features include a low ESR of just 10 mΩ and high ripple current capability of 3,7 A. Both the plastic can and the epoxy resin sealing material are designed to be flame-retardant in accordance with UL 94 V0. The capacitor is designed for a temperature range from -25°C to +65°C. It has an integral thermal fuse that trips at a current of 5 A and a temperature of 115°C.